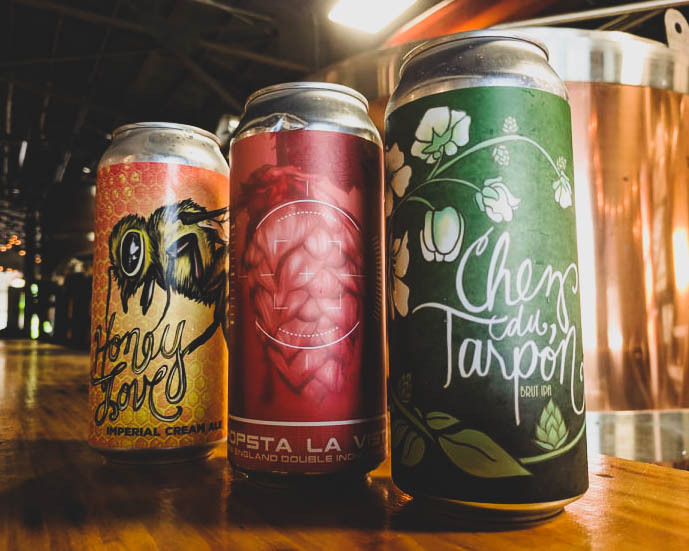 Tarpon River Brewing teamed up with Iron Heart Canning for the second time since our grand opening. Hopsta La Vista, a Double New England IPA that rests at a solid 8.5% with zero IBUs, is designed from the Terminator’s viewpoint and focuses on a single Hop. Target Acquired. It’s hazy, soft, fruity, and made with with Galaxy, El Dorado, and Mosaic hops added in the whirlpool in order to get the delicious flavors and aromas without all the bitterness (hence the zero IBU count). Chez du Tarpón is a Brut IPA, with 7% ABV and 30 IBUs. It’s citrusy and smooth with very light bitterness, and an extra fizzy factor to mimic champagne, as the artwork would lead you to believe (see: Perrier Jouet). 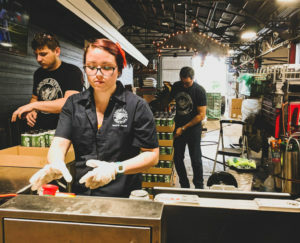 While we were at it we canned a few more cases of the Honey Love Imperial Cream Ale, our house favorite 9.5% wine-like beer made with real honey. These cans will be available for purchase on Saturday, December 8th. Makes for a great Christmas party favor, or a gift for your craft beer loving friends and family.